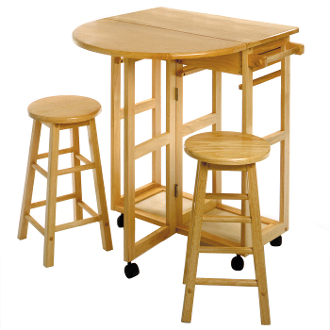 The 3-PC Space Saver Set is perfect for the space conscious person who wants to get the most out of thier dining area. The table has wheels giving it great mobility while the expandable drop leaf and stool storage provides great functionality. The two included round stools discretly stowes away into the body of the table below two drawers each measuring at 10.4"W x 10.4"D x 3"H. The overall size of the table is 29.7"W x 29.25"D x 32.75"H when fully opened with a table top dimension of 27.8"W x 29.4"D. When the drop leaf is down, the table measures 29.6"W x 15.5"D x 32.8"H and has table top dimension of 27.8"W x 14.7"D. The drop leaf is 27.8"W x 14.6"D. Each stool measures 11.6"W x 11.6"D x 20.75"H with a static weight capacity of 200 lbs. The set is made of solid and composite wood in a natural finish. Assembly required. Table top open size is 27.8"W x 29.4"D. Table storage position 29.6"W x15.5"D x 32.8"H.
Drop leaf size is 27.8"W x 14.6"D. Comes with 2 round stools at 11.6"W x 11.6"D x 20.8"H each. Made from solid wood in natural finish. Assembly required.